Strong, tough, safe and reusable, Gear Ties are the ultimate twist ties, suitable for hundreds of uses and built to be used again and again. 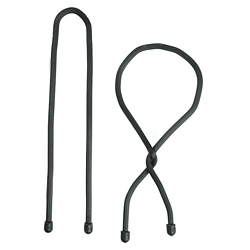 The tough bendable interior wire holds its shape, even while holding down stubborn and resistant loads. The rugged rubber shell provides excellent grip while keeping your fingers safe from harm. Perfect for use indoors or out, in any sort of weather.